Club Penguin Cheats by Mimo777 Club Penguin Cheats by Mimo777: Club Penguin Music Reviewed By You! "I love expressing my self through music! Whether it be playing the guitar or singing on a microphone, music makes me happy! Every penguin should have the amazing opportunity to play an instrument. Play away, penguins!" 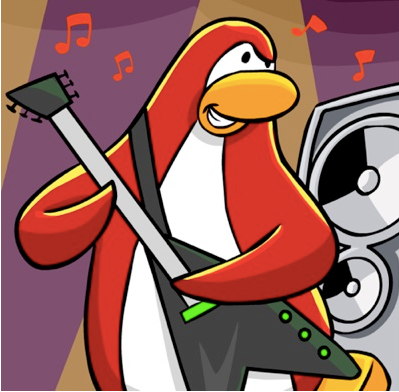 Club Penguin says there is going to be a TON of new places to dance at the Music Jam. So for next week, they want to know what your favorite dance style is? Coolio? I can't wait for the Music Jam, how 'bout you? Oh well. A cool room would be a Disco room! hey mimo777! I was wondering if you know this answer if u can plz reply! QUESTION: Im a member on cp and i gonna get 3 cp plush toys for my b-day!i wanna know witch one is very valueble so on the treasue book i can have ten things to recieve!!!! PLZ REPLY IF U KNOW THE ANSWER OR TELL ME THE BEST ANSER U NO FOR THIS!! If you want to check them out yourself, just click Toys, on the homepage, scroll down on the page you arrive on, and click view the treasure book! Well, every coin code from a plush penguin unlocks you 2 things. You get to pick which two things you want to unlock. But the plush penguin will be from a series, if it's a series 3 plush penguin you get to unlock 2 things from the series 3 Treasure Book. If it's a series 6 plush penguin you get to unlock 2 things from the series 6 Treasure Book. Bottom line, you can unlock two things per coin code. So your getting three plush penguins, you will get to unlock 6 items. Also, even when your not a member you get to keep what you unlock. That would be so fun! I loved the backstage. SO much to do there! Yea this week they were a little short. Disco time! It would be sweet to have a disco type room. Maybe in the pizza parlor! It's a random time when you get extra codes! You could get it on one toy, then get it on another a different time! To get 4 items, though, you must put in a certain number of codes for that treasure book! Then you unlock the Super exclusives page! Sorry I'm modding again! Yes it is something like that! So do I, but there aren't so many that I have left... I think Mimo is publishing them now, though! Me too! One of my favorite parties. Im going to have to find all the famous penguins. Just get your favorite. I actually don't have any mix and match figures. I just collect the plushies! I have lots of those. Maybe you can get the Gary set and the Herbert and Klutzy set! Oh I know this one! Pick me! Pick me! Ok here it goes, I'll mod you and you'll mod me! I love doing that. The post the penguin made was a little too short!! I hope the Music Jam has different free items than last year! You get to unlock the same amount of items with every plush you get. No plush is more valuable than another. I hope this answered your question! Yeah it 50-7f characters but I've seen people do more and less than that. I do not understand 100% exactly what you're saying... but you can choose what you want :) Maybe if you like dancing most you can get cadence and that kind of stuff. On the treasure book, you can receive all the things i think? Nice, too bad mine didnt get picked. Hey, that's cool! And... happy birthday! ;) Haha. Well, I'm not really sure which one is really valuable, but I think the items on the "exclusives" page are the best. Those items don't seem to be appearing on CP like some of the other clothes. Have fun picking out your items! That is not 50 - 75 words, but I can't wait for music jam. There could be a new room or what? Hmmm... let's see what happen on Friday guys! Well I thought that as well, maybe Club Penguin just liked that comment too much to not choose it!! Cant wait till the party and i'm definately gonna meet the music band! Just keep answering....i Bet mimo will notice you! We all Hope the same! P.s. i am trying for last 3 months. I agree but it dosent matter u know....they like it...they post it! Hey where can i buy decoding mimo in asia? I have theory about club penguin.You know when you submit a question in the news paper i think thier never read because the penguins name never have numbers in them and a hole LOT of penguins have numbers in thier name.One more thing i think when you report people club penguin dosent even look into them because me and my sister report each other all the time for real resons and nothing ever happens so club penguin dosent care. hi mimo! i have found a secret pin few other penguins have found. It's the ruby ring! 6.Now clik on the ruby ring. u HAVE NOW RECEIVED THE RUBY RING! That has been there for a couple weeks but good job though! Once again I agree CP should be more fair to non members but they cant get rid of memberships because that is how they earn money. Actually Club Penguin dos read the bans because one this person was saying bad things and I reported him. Then a couple mintures later he was banned. Good luck! I hope i meet the penguin band too! Yeah, CP apparently decided to keep that from the Adventure Party! Yeah, its supposed to be 50-75 characters but I've seen more and less than that. If Club Penguin likes it they will post it! Yeah, it was under the amount of characters that was required but it was good so Club Penguin decided to post it! I want to be a mod too! Good luck! I know, right? It's my favorite party, I love to rock out! Mimo had already posted about this a long time ago. It's always been there to tell you the truth. Sorry, but nice job finding it on your own! ~~~~~~~~~~~~~~~~~~~~~~~~~~~~~~~~~~~Yeah! But last year, they were really cool, too! each clubpenguin toy only gives you 2 items to unlock, so in order to get 10 items, you need 5 toys. however, after u enter 5 codes for ANY treasure book, u will unlock the super exclusives page in the newer books and will receive 2 extra items to unlock. hope this helped! ~~~~~~~~~~~~~~~~~~~~~~~~~~~~~~~~~~~ya there should be some instiments for nonmember there probly will so dont worry! I am replying to Ashly di response to my other post about I have a theory.How do you know he got banned he could of logged off. PLEASE POST and ashly di PLEASE REPLY. Oh well.A cool room would be a Disco room! Yes infact it is 50-75 words! maybe clubpenguin accepted that!!! On the Membership page on Club Penguin, there is a picture of the new All-Access Pass that will be used this year! me too! for us penguins on the older side, we want new items for the parties! ya i dont think i have ever met them- i want to so badly tho! i can see where you are coming from... i definitley think the same way when it comes to the first one. i havent really thought that much with the reporting- but i think your right! it is definitely more fun for members, but i have some maracas and a bell, and im a nonmember. true, those are the only instruments i can play (and yes, im trying to convince my parents to give me a membership on cp as an early bday present) but i still have two instruments. OMG dude you are a GENIUS!!!! thanks so MUCH!!! you should become a mod just because of that :B just to let you know, i want to give you a million jumping high fives right now! You seriously are a genius! HOW DID YOU FIGURE THIS CHEAT OUT???? plz answer! yeah it would! or an electric flute, or perferably a piccolo. k so APPARENTLY i didnt check up with this blog to see that this cheat was already posted. BUT still, great job!!!! Newpaper thing: They do read them, but they change the names. Lets say somebody asks a question about getting ready for Music Jam, they would make the name relate to the topic... such as "Red E", it sounds like "ready". They are just little puns(jokes). Reporting thing: They do in fact look at them. 2 of my acconut were banned after I was reported! (not the first second i was reported, but maybe the next day or something). When you report somebody, they read the whole chat of that room, so if your reporting for throwing snowballs, chances are they wont be banned. Well lately I think the pattern for free items for big partys is that CP might give out two free items, one being new and one being old. Usually the new items aren't as good as the old ones. This is the first time I have ever commented on your site. I have been using your site to check out whats new and pins I need to find. I have visited your site reguarly for 2 years. Im happy you dont do anything against cp rules! Yup...its sad..but we always get a free item! !..& If members were not Here then Clubpenguin will not be Here! Yeah man...but again members are here thats why Clubpenguin is here.